The Central Bank forecasts the inflation rate will grow by 2.6 percent this year, describing the increase in the general price level of goods and services as “manageable”. 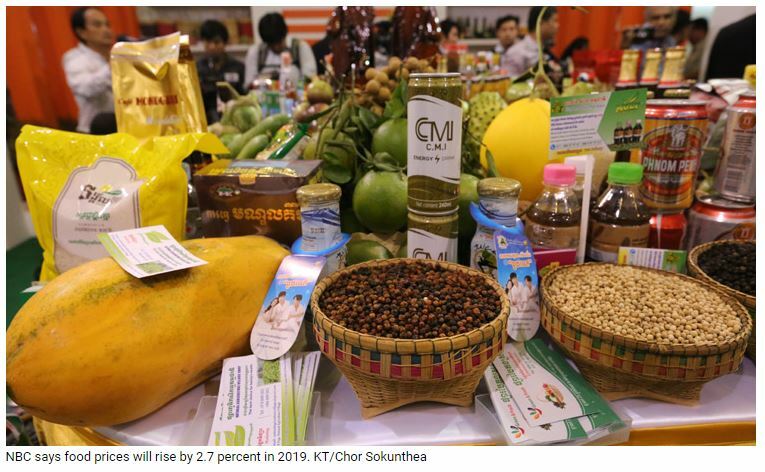 In its latest report, the National Bank of Cambodia predicts a 0.1 percent growth in inflation for 2019, describing current inflation as “stable”. Inflation will grow 2.7 percent in the first quarter of the year, 2.5 percent in the second, 2.7 percent in the third, and 2.5 percent in the last quarter, NBC forecasts. Food prices will rise by 3 percent, faster than 2018’s 2.5 percent, the result of an increase in global food prices and local agricultural commodities. The price of petroleum-based products will rise by 2.6 percent, slower than last year’s 3.7 percent, NBC notes. Chan Sophal, director of the Centre for Policy Studies, said these inflationary trends reflect the current economic performance of the country, adding that inflation was under control. “Inflation means our people can earn more and afford their daily expenses while producers can earn higher profits. “At this rate, inflation is not a concern. As long as it stays below 5 percent, it shouldn’t be a problem to the economy,” he said. NBC governor Chea Chanto said the country’s economy is expected to grow at seven percent this year with a lower inflation rate and a stable US dollar-riel exchange rate. He said international reserves will reach $11.3 billion, enough to ensure the import of goods and services for the next five months.